Did you know how useful a ‘SKIPPING’ rope can be? How many of us remember our childhood, when we used to skip and even had challenges among ourselves to find out who could skip the fastest. Those memories of my childhood bring back a smile on my face. I used to enjoy those skipping moments. There were several games we could play with the skipping rope and it was one of the cheapest games that one could purchase. The best part of a skipping rope was that people of all ages could use it. I did not realize the benefits of a skipping rope until I joined the fitness industry. It is not just used for playing as we did in childhood. It’s a fantastic workout tool. You do not have the time to go to the gym and workout due to lack of time. You could try skipping. 15 minutes of intense skipping is good to burn calories. Skipping improves your footwork, speed, coordination, stamina, agility, and it strengthens the muscles in your legs as well as your abdominal, back, chest, arms and shoulder muscles. Skipping is good for building your cardio workout same as a jog or a bicycle ride would do. It has relatively low impact on the joints but, yet its intensity is high that gives a fabulous cardio workout that’s less dangerous and surely less strenuous than running. Twelve minutes of jumping rope is roughly equivalent to running 6 minute per KM (kilo meter). Then again take a rest for 20 seconds, and repeat again for 10 minutes. Reason behind of this type of skipping is that it enables you to improve your cardiovascular as well as muscular endurance and it will help you to burn more calories. Beginners should jump twice between each rotation of the rope. The basic aim here is to get your abdominal and calf muscles into shape. While skipping, you have to be careful that your arms do not move. You should rotate the rope with the circular movements of your wrists. You should not jump very high. Jump 1 to 2 inches off the floor, giving rope just enough space to slip under your feet — only the balls of feet should touch the floor. Keep your elbows close to your sides as you rotate the rope. The movement comes from the wrists and forearms and not the shoulders. If you tire out before you finish the workout, drop the rope, but keep arms and legs going. To find a rope that fits place one foot in the center of the rope and lift the handles — they shouldn’t go past your armpits. Speed Rope: It is lightweight and great for speed. Mostly used by elite athletes to develop footwork, coordination and conditioning. For example, boxers use a speed rope during their general strength and conditioning workouts. The digital rope: A digital jump rope will count the number of jumps you have made. It will also keep track of the number of calories you burn during each jump rope training session. Some will also keep track of the length of the workout. Weighted jump rope: It has weighted handles. The idea behind this rope is that the extra weight on the handles provides an extra workout for the upper body like wrist, forearm and triceps strength. Leather Jump Rope: A good-quality leather jump rope is a great choice for serious workouts. These ropes either have plastic or wooden handles, and a strip of leather for the rope. Compared to the cloth jump rope, a leather jump rope turns much faster, providing a serious cardio workout. Professional boxers have used leather jump ropes for years when training. Beaded Jump Rope: It consists of plastic beads strung on a thin piece of nylon cord. Like cloth ropes, beaded jump ropes are very economical. These ropes are fun for a while, but are not recommended for intense jump rope exercising. Kids Jump Rope: The jump ropes for children need to be shorter than adult ropes. It is the best to start with a beaded rope, because they don’t tangle as easily. Make sure that the rope is not too short, or it will lead to too many errors and the child may get discouraged. So what are you waiting for? Get up and start Skipping. When was the last time you ate a handful of fresh berries…??? Can’t remember….Here’s the reason…. Berries are tiny, uncommon, ignored, and may be expensive. Moreover, they are more familiar in foods such as cakes, jams, candies, etc. But, these berries overflow with numerous health benefits. They truly deserve the title of being called “real treasure in a small package”. Not sure if you are aware but there are a variety of berries available in the market. Another trivia on berries is there is also something called the National Berry Month celebrated in July. I found it interesting to write a blog on ‘Berries’, the not so talked about but beneficial fruit. 1. The bright red, maroon or purple colour of the berries is due to the presence of pigments or natural dyes called phytochemicals which act as an anti-oxidant. These antioxidants slow down your ageing process. 2. They prevent heart diseases and cancer due to the presence of Gallic acid. 3. They are very low on sugar as compared to other fruits and rich in fibre and thus they help in weight management and improving digestion. They also keep you fuller for a longer time. 4. They contain certain organic acids which help in our body detoxification. 6. Lastly they are loaded with vitamin C, known to strength our immune system. Few berries that I have been eating are listed below. You can eat them as it is, soak them, add them in your breakfast cereal/ yoghurt or make homemade sauces. In short you can literally play with them! 1. Blueberries: No wonder they are called as the “blue dynamos” due to its deep blue colour. Rich in manganese, vitamin K they provide around 4 grams of fiber. They can be eaten fresh as well as dried. Try tossing them into salads, smoothies or baked items. 2. Cranberries: These red berries are not only pretty looking but are infection fighting super berries. Packed with flavonoids, they are a great remedy to fight Urinary Tract Infections (UTI’s). It’s got a sweet as well as a tart flavor which makes them a perfect ingredient for smoothies, sprinkling them into oatmeal or salads. 3. Strawberries: These red health boosters are the most common types of berries consumed. They grow abundantly in India too. They are rich in antioxidants called phenols which help in boosting immunity. They are perfect for a mid-evening snack with just 50 calories per cup and more vitamin C than an orange. They can be relished in smoothies, frozen yoghurts, breakfast cereal and salads or just mixed with plain water. 4. Mulberries: Many of us including me have eaten a handful of these freshly plucked from the trees in our backyard. These delicate berries are packed with heart healthy phenols, Ca, iron and magnesium. A cup of these provide more potassium than half a banana! They can be enjoyed frozen, in smoothies or sorbets. 5. Acai berry: A dark coloured berry resembling grapes is a native of Brazil. They are amongst the top super foods having 19 amino acids and high levels of antioxidants. 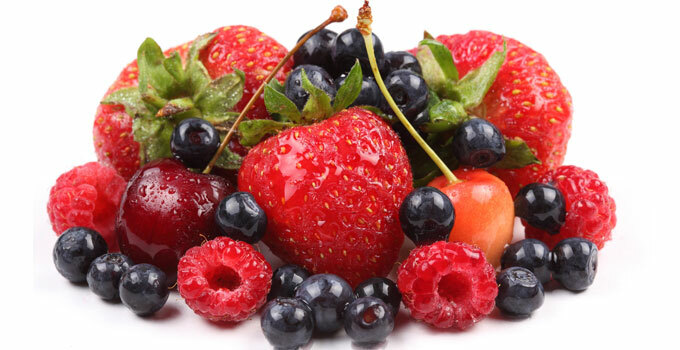 These berries have recently gained popularity since they claim to have weight loss properties. However, this is just another fad although it helps lowering bad cholesterol. These berries are very expensive since they have to be freeze dried within 24 hours of plucking to retain its nutrition. Apart from these berries, there are a few more berries – Goji berries, Huckleberry, Maqui berry, Sea Buckthorn berry, etc to name a few which may not be that common in India but are of equal benefits to our health. So what’s your favourite berry? Go ahead and start including these berries in your diet as they are the “nature’s multi-vitamin”. How to choose proper footwear? One of the most common questions asked by people before starting any type of workout regime is what shoes do we get? In fact with the Oxfam 100 km Trailwalker challenge just around the corner, this topic has gained more attention. Imagine walking 100km or running 42 km or hiking or trekking without proper shoes. It could just be disastrous. And history is witness that most people back out from such challenges midway not because of lack of motivation or because they are tired. But give up largely due to foot injuries caused due to bad shoes. Why it is important to choose the right foot wear?… A very Important aspect of workout which is often neglected. A good workout is achieved with good footwear. Bad shoes can derail all the efforts that you have put in to your workouts and bring your fitness to a standstill due to injury. Strenuous outdoor workout or long distance running puts increased amount of pressure on your feet and therefore wearing the right shoes are important to prevent injury. According to University of Illinois’ McKinley Health Centre’s note on foot type and proper footwear, foot problems are one of the most common health complaints. The high incidence of foot problems is understandable given the fact that there are 26 bones, 33 joints, 112 ligaments, and tendons, nerves, and blood vessels in the foot. It’s even more understandable when the weight of the body is considered. The force of the body weight borne by the foot increases roughly 1½ times during walking and up to 3-4 times during running. Add in 10,000 steps during a typical day while wearing ill-fitted shoes possibly, and it’s a wonder one’s feet are willing to get out of bed the next day. 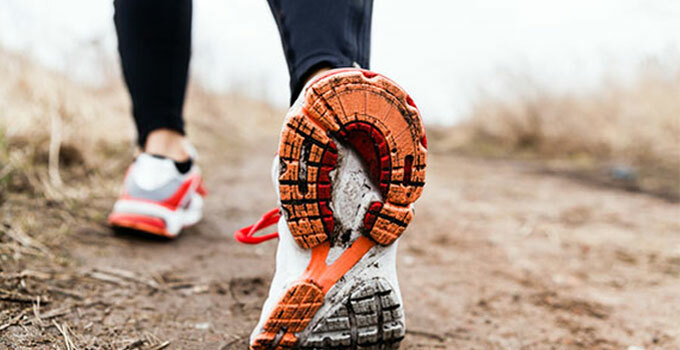 Working out or indulging in outdoor sports with bad shoes can result in injuries such as ankle pain, blisters, swelling in your feet and the likes. A condition called Plantar Fasciitis i.e. damage and inflammation to Plantar Fascia (a connective tissue on the sole of foot forming the inner arch) is caused due to repetitive activity creating a strain on plantar fascia. Another common condition often faced by people is Achilles Tendonitis i.e. tissue damage and pain to Achilles Tendon caused during the contraction of the calf muscles. When the calf muscles contract some amount of tension is created on the Achilles Tendon and Wrong footwear further adds to that stress. It is important to understand your foot type. Visit a store that specializes in all kinds of sporting and athletic footwear. The associates there can help you find a shoe that’s appropriate for your foot type, the way you walk, and your sport. The right time to buy a shoe is in the evening when your feet are tired and there is more swelling in the feet..
For Sportspersons variety of shoes are available depending on the type of sport. Running shoes have inbuilt shock absorbers, walking shoes are light weight and for Hiking one can choose low, mid or high cut shoes. High cut shoes or commonly known as Ankle shoes protects the ankles and provides more protection. And, finally there are the cross training shoes which are suitable if you do more than one type of workouts. One size larger than your usual shoe size is better in terms of trekking and trail running shoes. A good shoe must support your foot, front and back and provide protection, stability and good shock absorption.